The master’s tools will never dismantle the master’s house. Audre Lorde said this in 1984 to propose that those seeking equality stop using the tools of the white, patriarchal society to effect change. Lee Daniels challenges Ms. Lorde’s assertion on a number of levels with his new film, The Butler. A perusal of Daniels’s work suggests an intriguing if heavy-handed director. He’s drawn to provocative stories, but tales that might otherwise feel subversive tend to spring from Daniels’s camera a little pulpy, a tad melodramatic, sometimes even lurid. His greatest strength to date has been in casting. His second has been in eliciting revelatory performances from those casts. But understated, he will never be. His latest effort suggests Daniels has leveraged the creditability he earned with Precious (and nearly lost with The Paperboy) to make the leap to Important Hollywood Movies. How Important and Hollywood? Oprah stars. This well-stocked cast populates a yarn about a White House butler (Forest Whitaker) who watched his father shot to death in a cotton field and witnessed 8 different presidents and the social upheaval of eight administrations before finally casting a ballot for his country’s first black president. And yes, Daniels employs all the tricks of the trade for his generational eye-witness tale of historical change: era-appropriate clothing and hairstyles, a personal involvement in every major historical event, old people make up. How he uses these items, however, suggests a slyer filmmaker than some might predict. Yes, his story is of a man who embraced a society-approved role as butler, and in being a good man in the right place, was able to impact cultural decisions. That is, he used the master’s tools to dismantle the master’s house. Add to that his cagey casting. Some intriguing and generally successful choices: John Cusack as Nixon, Liev Schreiber as Lyndon Johnson, and Alan Rickman, sublime as Ronald Reagan. And how ingenious is it to hire Jane Fonda to play Nancy Reagan? Speaks volumes without saying a word, doesn’t it? The whole affair offers a crafty playfulness hidden by the gloss of the packaging. 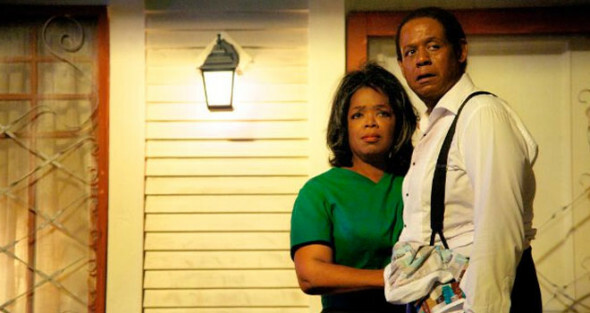 Is The Butler a self-important, melodramatic tear jerker? Oh, hell yes. But it’s a real surprise as well.